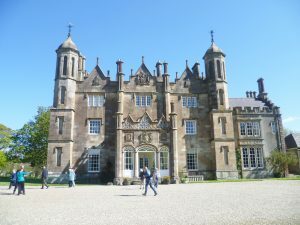 The story of Glenarm Castle begins with a murder. In 1242, John Bisset, a hot-headed young Scot of Norman origin, was implicated in the murder of Padraig, Earl of Atholl, after a tournament in Haddington, where John’s uncle Walter was beaten by the earl. In revenge, John murdered the earl, set fire to his house to conceal the crime, and fled to Ireland. It was John Bisset who built the first castle at Glenarm on the Antrim coast, facing his old homeland. Bisset then fades from the castle’s history. But every castle worthy of the name needs a good murder in its founding story. The present castle was founded by Randal MacDonnell, 1st Earl of Antrim in 1636. As well as a murder, every castle perhaps also needs to be attacked and burnt down at least once and, only four years after the new castle went up, it was burned down by marauding Scots. It wasn’t until the 18th century that it was properly rebuilt, this time as a large Jacobean-style house, with attractive three-light Venetian windows, steep pointed gables and decorative castellation. What we see today is the result of further alterations and rebuilding after another disastrous fire in 1956. View from the front of the house, looking out over the countryside. The sheep are just visible, if you peer closely. When Randal, Viscount Dunluce, heir to the current Earl of Antrim, took over the castle and grounds twenty-five years ago, both the house and the estate were in a sorry state of repair and he and Lady Dunluce have had to work hard to make it economically viable. Semi-derelict estate cottages were repaired and are now lived in or rented out; and an interesting selection of events have been inaugurated. 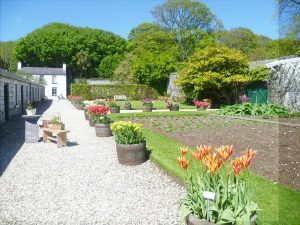 For example, the annual Dalriada Festival, which celebrates Scottish and Irish sport, food, and music takes place at Glenarm; and new facilities now allows the estate to host large outdoor concerts. You can also get married at Glenarm. 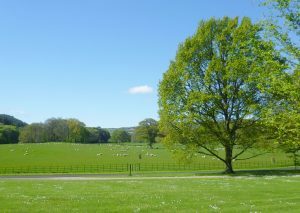 Looking out over the lawn to the park beyond, where once deer might have roamed, sheep now graze. The home farm is run organically and also breeds shorthorn beef cattle. The Glenarm organic lamb and beef are now prize-winning and sought after products. 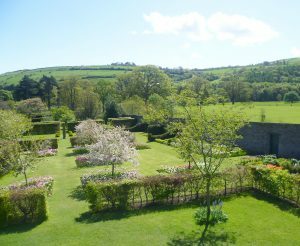 The castle’s garden, which includes a walled kitchen garden, was created in the 1820s to provide the castle with fruit and vegetables. 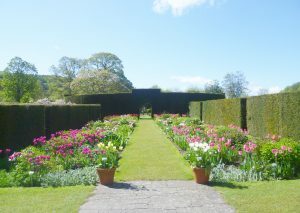 The 1820s formal garden, with its various ‘rooms’ hedged by clipped yews, has been extended and is open to the public between May and September. The Mound, which looks like a snail shell, was built in 2007 with a circular path winding up to the top, from which there are splendid views over the garden, with a wood full of mature trees in all their late spring glory in one direction, the countryside to the south and the sea to the north. 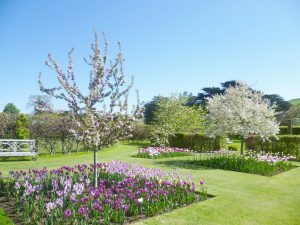 I visited Glenarm a day or so after their annual tulip festival; and there were masses of brightly-coloured tulips, as well as my favourite, apple blossom. The Discovery apple trees espaliered against the wall have been planted for their decorative quality; the blossom is beautiful in spring, and the glowing red apples add a decorative touch in autumn. 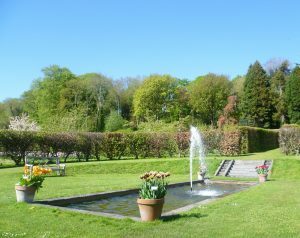 There is also an attractive water feature with a rectangular stone-edged pond with a fountain, and four terracotta pots, currently containing tulips, marking each corner. 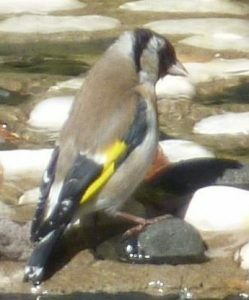 In a small rill nearby, lined with decorative pebbles from Glenarm beach, I spotted a goldfinch hopping in and out of the water, searching for small insects. I crept up to photograph it, thinking how unexpectedly well the goldfinch’s red and yellow flashes of colour camouflaged it against the multi-coloured pebbles. 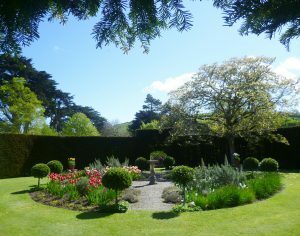 I particularly liked the circle of clipped yew surrounding the herb garden which also dates back to the 1820s. I love the pompom bay trees, the rosemary and lavender – and, of course, the tulips. You come into the circle through a tunnel of yew, so there’s a touch of the secret garden about it. It wasn’t until I was actually inside and could suddenly smell the herbs that I realized what sort of garden it was. It was almost time to go, but I can never resist a craft shop and, just by the entrance to the castle café, I spotted a row of small buildings, one of which had a Craft Shop sign. I headed for it like a homing pigeon. Thanks for the post. Very pretty gardens. Thank you, Gail. I’m delighted you like them. When I visited, tulips reigned supreme, but I’m sure different star flowers will delight visitors throughout the year.